Step one in the prospective process, is for the CDI specialist to pull an initial worklist from the patient population lists within each office. Which offices covered, and the frequency of visits depends greatly on the structure of the program developed at the outset. Many programs assign staff to specific offices, and others rotate staff from office to office so that every member of the CDI team gets to know the physicians and office staff at each location. The CDI staff will review initial records as well as post-visit records to determine appropriate coding and to query physicians as necessary. The purpose of this review is to communicate to the attending physician regarding documentation opportunities that more accurately reflect a patient’s severity of illness, particu­larly in capturing diagnoses which affect hierarchical condition category (HCC) assignment. Any and all communication with the attending physician must be based on CMS coding guidelines, and collaboration with coding consultants and coders, performed as appropriate. All reviews requiring clarification and updates should be tracked, whether the team uses an electronic system, a spreadsheet, or other method. This information will be reviewed on an ongoing basis for discussion, program evaluation, and educational opportunities. When educational opportunities are identified, the CDI staff needs to work with the physician’s office manager to establish a suitable time for further discussion. When a query is sent to a provider, the provider has a limited time to respond. Some facilities set this at two business days, others at 24 hours. Ask your manager or mentor what the policy is for your team. If a query goes unanswered beyond the allotted time, the query could be brought to the coding manager, office manager, or physician advisor’s attention for follow-up. Retrospectively, the CDI specialist reviews the spreadsheet information from the facility and compares the information from the electronic health record system to ensure the diagnoses queried for by the CDI staff were captured by the provider and the coder. If the diagnosis isn’t captured by the provider, the CDI specialist needs to note this and be sure to review the record again for that patient at his or her next regularly scheduled appointment and perhaps follow up with the physician to clarify any developments from a particular visit. If the physician documented the diagnosis but the coder failed to capture it, then the CDI specialist needs to communicate with the coder regarding the reasoning (coding guidelines, coverage determination, other reason). 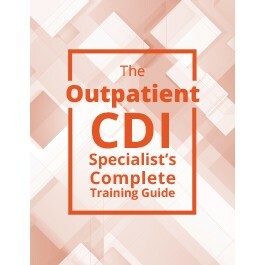 Editor’s note: This is an excerpt from The Outpatient CDI Specialist’s Complete Training Guide.